At the heart of Compassion Focused Therapy (CFT) is an evolutionary model of human motivational systems. Developed by Paul Gilbert it is a helpful lens through which to understand human thought, emotion, motivation, and behavior. Compassion Focused Therapy (CFT) builds upon evolutionary ideas about human brain function. Paul Gilbert argues that the human brain is a product of evolution and that our thoughts, emotions, motivations, and behaviors can be understood in terms of the advantages these ways of thinking, feeling, and acting posed for our ancestors. 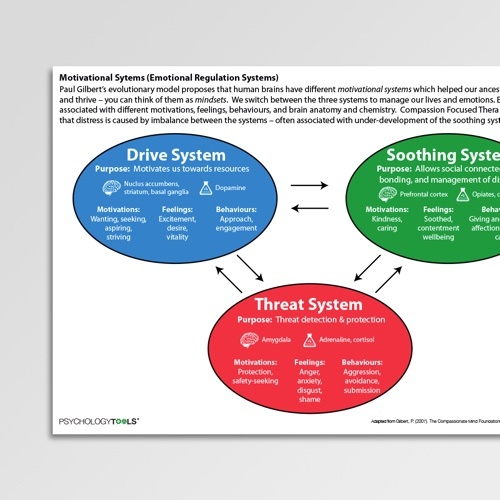 The model proposes human beings have a tripartite motivational system (which is sometimes referred to as an emotional regulation system) with different systems which can be conceptualized as ‘mindsets’. People can be in states of ‘threat’ (with a mindset focused on seeking protection from dangers), ‘drive’ (with a mindset attuned towards wanting, seeking, aspiring or striving), or ‘soothing’ (with a mindset attended to giving and receiving care, affecting, and nurturance). Importantly, healthy functioning of the soothing system is necessary for self-soothing – without it individuals are prone to self-criticism, self-attack, and shame. Each of the states are associated with distinct feeling-states, motivations, behaviors, neuroanatomy and neurochemistry. CFT proposes that healthy functioning requires adaptive use of all three of these systems in appropriate measure. Dysfunction is said to come about because of limited flexibility, or over-use of one system to the detriment of others. A less functional or less active soothing system is often the result of trauma, neglect, or inadequate opportunities to learn soothing from important caregivers. 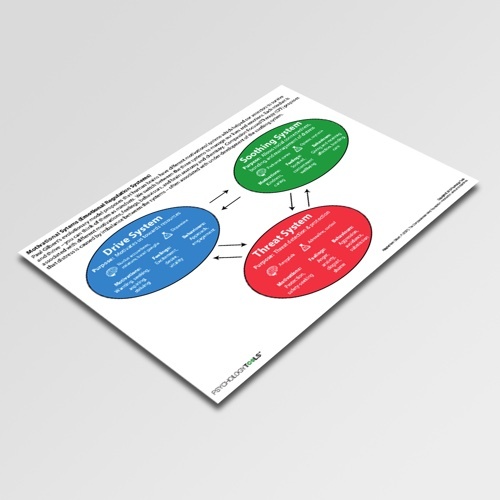 Compassion Focused Therapy uses this tripartite motivational model as a foundation and encourage clients to develop a more compassionate mindset. 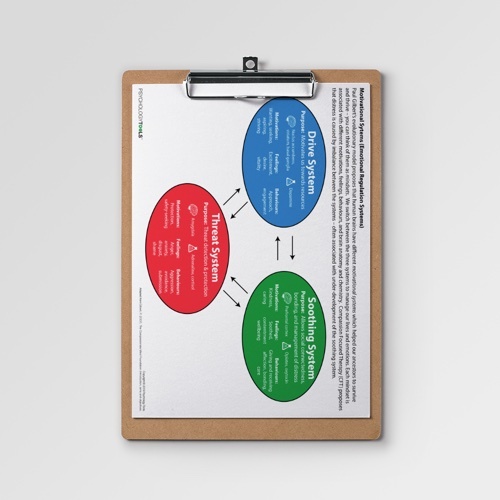 The Motivational Systems (Emotional Regulation Systems) information sheet is a simple outline of the CFT model. Clinicians should be aware that the notes regarding neuroanatomy and neurochemistry are necessarily speculative but are consistent with what is known about brain responses to threat, reward (wanting), and affiliation. Gilbert, P. (2009). Introducing compassion focused therapy. Advances in Psychiatric Treatment, 15, 199-208. Gilbert, P. (2009). 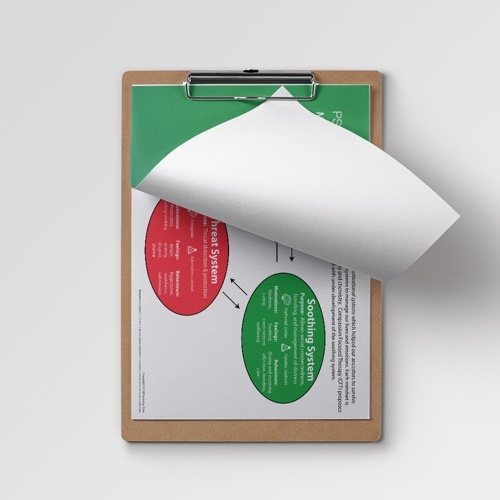 Developing a compassion-focused approach in cognitive behavioural therapy. Cognitive behaviour therapy: A guide for the practising clinician, 2, 205-220.